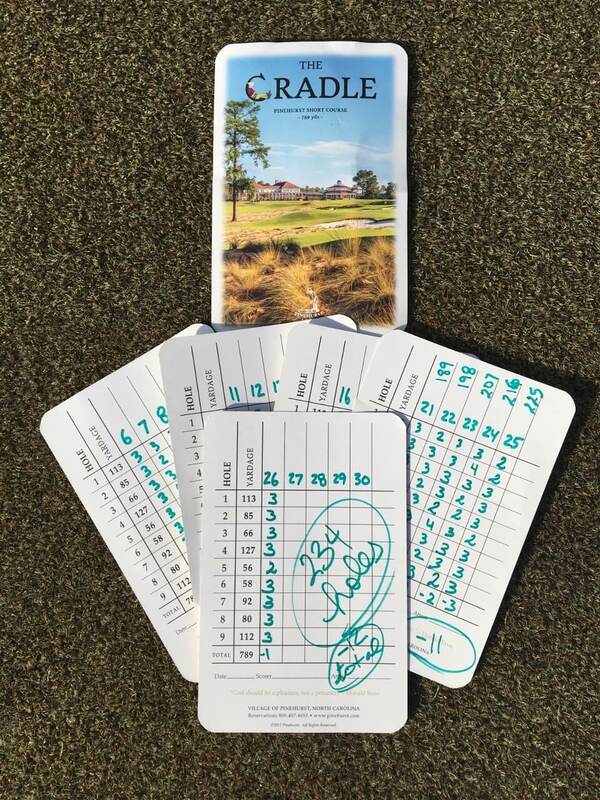 On Thursday, Dec. 21, Pinehurst golf professional Kelly Mitchum celebrated the winter solstice in a wonderfully unique way – he played Pinehurst’s shortest course, the 789-yard Cradle, on the year’s shortest day, hitting his first tee shot at sunrise at 7:22 a.m., and holing his last putt as the sun set at 5:08 p.m. The numbers from his day are staggering. 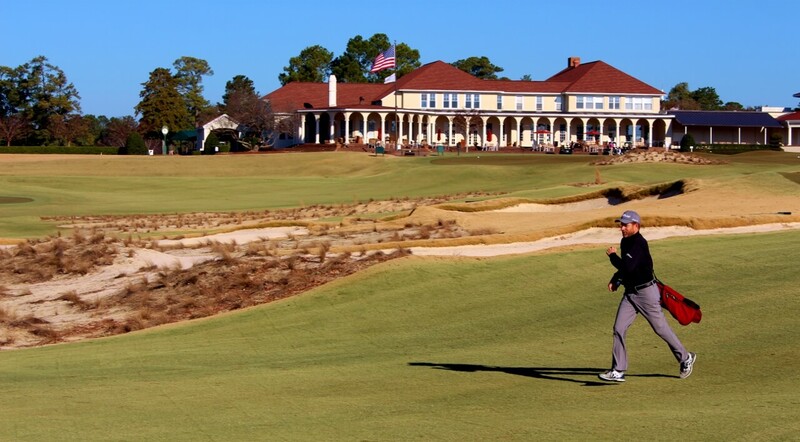 It is fair to say that Mitchum is Pinehurst’s most accomplished player. He’s appeared in four PGA Championships, was a Walker Cup member, reached the semifinals of the U.S. Amateur, won the 1993 North & South Amateur, and has played in numerous PGA Tour events. Also, he did this…and this. Still, Mitchum’s play on The Cradle was remarkable. Mitchum played a total of 26 full rounds on the 9-hole Cradle. He played a total of 234 holes. Mitchum had one hole-in-one, which came on the 3rd hole, also known as the Punchbowl. For the round, Mitchum shot 12-under-par. Nine of Mitchum’s 26 rounds were bogey-free rounds. His longest stretch without a bogey was 32 holes. Mitchum walked about 16 miles on the day. He averaged 2 1/2 minutes per hole. Mitchum’s quickest round was played in just 12 minutes. Mitchum’s lowest round was 4-under 23 (the course record is 21). His highest round was 4-over 31 (his 5th round of the day). Mitchum admits to being very sore by the end of the round, and perhaps even moreso the next day. He was treated to a massage and cryotherapy at The Spa at Pinehurst, and says he felt much better after both treatments within another day. 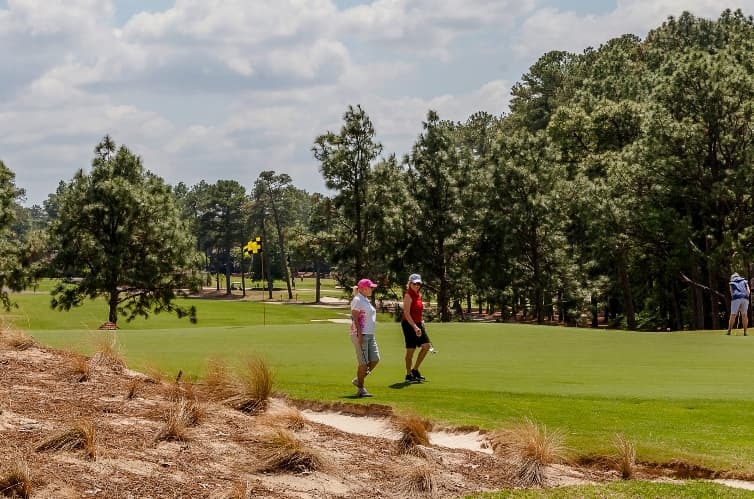 Mitchum’s day proved to be popular on social media and around Pinehurst Country Club. Many people came out to congratulate him at sunset. Mitchum plans to try the feat again next winter solstice, and Pinehurst plans to add a charitable aspect to the day.